Mark Garland, who died of cystic fibrosis in 2003, is an inspiration for many of today’s local 4-Hers who show hogs. He had a strong passion for showing hogs, as seen here at the Fayette County Fair. When Aubrey McCoy won the grand champion hog trophy July 20 at the Fayette County Fair, it was a moment of pure joy and accomplishment for the 14-year-old and her family – a proud family with a strong tradition of raising and showing hogs. But as the moment subsided and the celebration ended following a long, arduous day of hog-showing, the trophy presentation itself evoked a brand new wave of emotion for several who were involved in the process. It wasn’t so much the trophy, but rather the name that’s engraved on it – the man who the trophy is named for: Mark Garland. Mark, another hog enthusiast whose family has deep roots in the Fayette County farming community, was diagnosed with cystic fibrosis at 8-months-old. No, Mark beat the odds. With a zest for life and a passion for hogs and fast cars, he lived until the age of 26 before finally succumbing to the disease which causes persistent lung infections and limits the ability to breathe over time. “He was in the hospital for years. He had to have a lung transplant in ‘02 and then he died in ‘03,” said Jim. His 40th birthday would have been today. Since Mark passed away, his father donates enough money to ensure that every year, the hog grand championship trophy is named after his beloved son. Aubrey’s father is Bryan McCoy, who had much success as a hog showman in his own right. 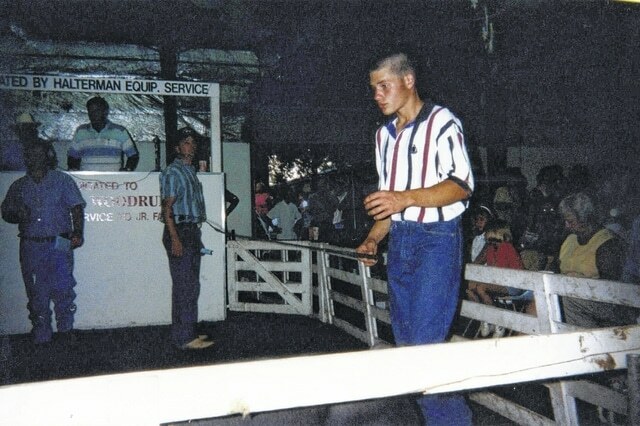 Twenty-three years before Aubrey claimed the top prize, Bryan won the grand champion hog trophy at the Fayette County Fair. Eight years prior, Bryan’s sister, Bethany, won the state grand championship. Success in the hog business has always been important to the McCoy family, but the relationships they’ve built along the way have always meant even more. Bryan and Mark Garland were close friends growing up on their respective farms as neighbors. Bryan graduated from Miami Trace in 1994 and Mark in ‘95. Bryan was visibly emotional following his daughter’s victory at this year’s fair. The reason is twofold. Also in Bryan’s thoughts was the man he grew up with, a man who meant so much to him. Mark’s influence and legacy have shown themselves in many tangible ways, but then there are also several almost uncanny signs that Mark may have been looking down on the market hog show last July. Interestingly enough, they all involve the number 13. It was 13 years ago that Mark passed away. Aubrey was 13 at the beginning of the 4-H year, a year that culminated in her grand championship victory. Her champion hog’s ear tag was 292, which adds up to 13. Bryan was born in ‘76, which adds up to 13. Bethany McCoy’s state fair hog championship came in ‘85, also adding up to 13. Bryan graduated from high school in ‘94, which of course, adds up to 13. “It was our lucky number this year,” said Jim, who also has fond memories of being neighbors with the McCoy family. Another close friend of Mark Garland’s, Nathan Warner, was also moved by Aubrey’s accomplishment and watching Jim hold the trophy. To this day, Warner is still close with Mark’s younger brother, Luke Garland. Also, Warner just happens to be the person who sold to the McCoys the hog that became this year’s grand champion. Warner sent a message to Luke Garland the night of Aubrey’s victory. https://www.recordherald.com/wp-content/uploads/sites/27/2016/08/web1_MarkGarland.jpgMark Garland, who died of cystic fibrosis in 2003, is an inspiration for many of today’s local 4-Hers who show hogs. He had a strong passion for showing hogs, as seen here at the Fayette County Fair.